Summary: The brooding and foreboding power of the film matched with Caine’s colossal performance guarantee the lasting quality of a film that seems so rooted in a specific long-distant past, yet so thoroughly assessable and timeless. Once every so often a film emerges that appears to epitomise the very mood of a place at a specific moment, so that it eventually becomes a veritable touchstone/shorthand that future generations can utilise to tap into the precise spirit of the age. The place is Britain. 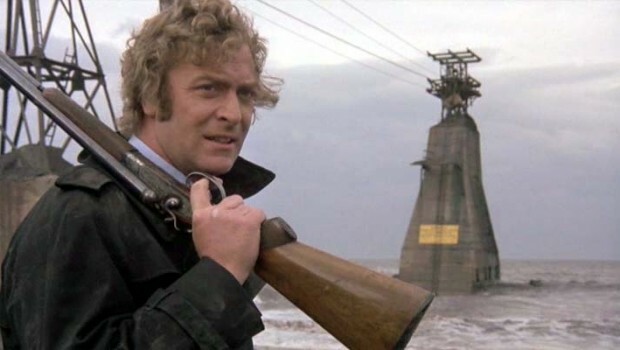 The time is the post-industrial and discontented 1970’s and the film is “Get Carter”. “Get Carter”, has long been credited with so called “iconic status”, but what does this term really mean? The film is a prime exponent of the British Gangster Film (now bastardised by the likes of Guy Ritchie and his watered down, carry-on style offerings) yet, like all great movies, it positions itself within the classical conventions of a particular genre in order to transcend them, and change their very nature forever. The narrative is simple enough, but offering a feast of complex implications after one scratches the surface. “Caine is Carter”, as the tag line states, filled out and displaying an air of latent menace, the evil alter-ego of Alfie and “The Italian Job’s” Charlie Croker, exhibiting the same charisma without any of the optimism. Jack Carter is an oppressive London enforcer, who returns to Newcastle (his “old stomping ground”) to piece together the mystery surrounding his brothers’ apparent “suicide”. Subsequently Carter unravels a hierarchy of despicable individuals responsible for his brothers’ death and proceeds to deal out his own form of justice, in a cold and ruthless manner. Therein lies the most innovative, refreshing and complex aspect of Get Carter, the supposed hero sweeps in to clean up a town over-brimming with filth, centred around a cast of callous individuals (there are few redeeming or positive characters in the text) in a plot not unlike the conventional “Meta-narrative” format of the Hollywood western. However Carter proves himself to be just as calculating and spiteful in seeking his revenge. He stalks his prey with bravado and near-relish, killing unremorsefully on his unremitting quest to destroy the accused. He offers no apology for the course of action he feels bound to take, in this sense and largely due to Caine’s dark performance, the viewer comes to almost sympathise with Carter in his quest, and this proves enormously unsettling. The urbane and sophisticated ways of the South, personified in Carter who orders his beer to be served “in a straight glass”, rather than a tankard, are continually juxtaposed with those of the industrial north-east. Every shot of the landscape consists of stark, grey images and colourless, wrung out tones. Exterior shots of smoke belching chimneys and disintegrating docklands compliment the confined interiority of claustrophobic terraced houses and pubs. The land is portrayed as cruel, pessimistic and discontented. Similarly the technical innovations that emerged in filmmaking in the seventies are widely implemented. The use of the telephoto lens to approach scenes from a distance (such as Carters’ confrontation with Eric at the Racecourse) is utilised frequently. Often heads are shown obscured in extreme close up, out of focus in relation to figures and objects in the middle distance. The sardonic and bitter tone of the film is embodied in Caine’s portrayal of Carter. Behind the superficial residual traces of the sixties such as the sharp suits and the sporty cars, lies an overwhelming sense of disillusionment, as if the party has well and truly ended, exemplified in Carters’ unfulfilled ambition to escape to South America. Overall the film is deeply lacking in hope. Yet again from this it gains most of its strength. The brooding and foreboding power of the film matched with Caine’s colossal performance guarantee the lasting quality of a film that seems so rooted in a specific long-distant past, yet so thoroughly assessable and timeless.